I can't believe Christmas is in 20 days!!! I seriously need to start my holiday cardmaking. Have you started yet? Oh please don't tell me you're done! 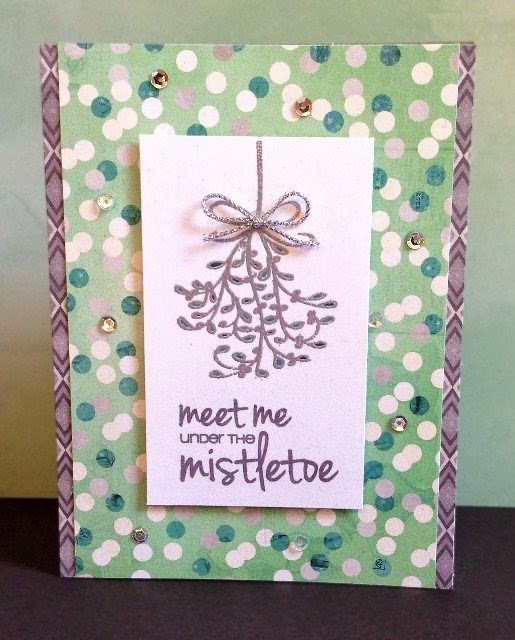 Girl Friday Marcie came up with a real cutie using our Merry Kiss-mas stamp set. Isn't it fun and cute? I love her random sequins, and the little cord bow tied on. to see what might help me make a few cute cards. The papers she chose are not traditional Christmas papers, but they certainly make a fun and festive look. be sure to check out our Pinterest Boards. Each set has its very own board! How fun is this?! awesome use of non-traditional colors. So sweet! Love it to bits, Marcie! LOVE your colors. Thanks for sharing your beautiful card.